With the Festool MFH 1000 Multifunction Stool, you not only get a durable, steel-construction, mobile workstool, you also get a customizable storage chest. A sturdy, generous drawer and deep internal shelf with pegboard sides provides ample storage options that can be easily customized to meet your specifcations needs. 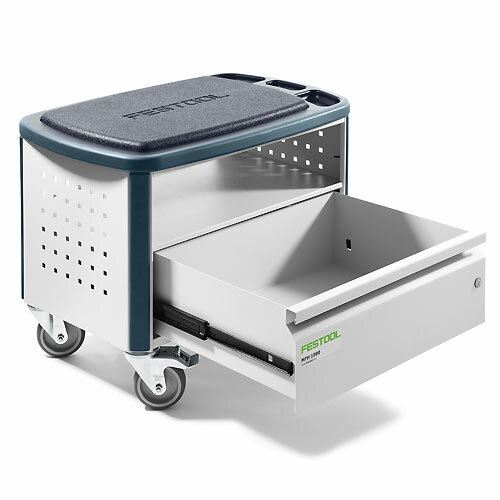 As a combination mobile work stool and storage cabinet, the MFH 1000 is ideal for tackling specialized tasks wherever the work takes you. Get through the end of the day feeling good about your work and better about your back. 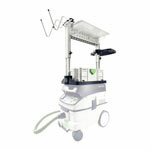 The mobile, yet comfortable MFH 1000 will reduce stress and strain during tedious assemblies and other prolonged tasks. 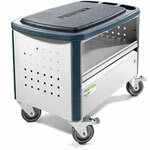 MFH 1000: Includes the Stool; a Foam Seat Cushion; Keyed Lock with 2 Keys; can 4" Casters (2 locking).